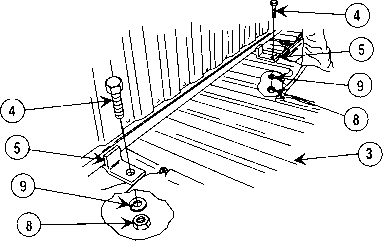 (1) Traversing and elevating mechanism. The bar and bearing assembly head serve as a rear support for traversing and elevating mechanism, which in turn supports the M60/M240B/M240G/M249 machine gun. M122/M122A1 tripod mount has a double, screw-type traversing and elevating mechanism. The upper screw is attached to the yoke, which is connected to the M60/M240B/M240G/M249 machine gun by the quick release pin through the holes in the rear mounting lugs of the receiver assembly. A scale shows 250 mils in depression and 100 mils in elevation. A setscrew fastens the elevating handwheel to the upper elevating screw, permitting the handwheel graduations to be synchronized with those on the screw. The traversing sleeve and screw are clamped in place on the bar by the traversing slide lock lever. The traversing sleeve is properly mounted when the lock lever is to the rear and the traversing handwheel is positioned to the left. The traversing and elevating mechanism requires an adapter for the M60 and M249 machine guns. (2) The M122 tripod has three tubular folding legs connected at the head assembly. The rear legs are joined together by the traversing bar assembly. The head assembly furnishes a front support for the machine gun through a pintle attached to the machine gun and the tripod. (3) The M122A1, similar to the M122, utilizes the flexible mount for the M240B and M240G machine guns. The flexible mount replaces the pintle and provides soft recoil capability. (1) Traversing and elevating mechanism. The traversing bar assembly serves as a rear support for traversing and elevating mechanism, which in turn supports the M2 machine gun. The M3 tripod has a double, screw-type traversing and elevating mechanism. The upper screw is attached to the yoke, which is connected to the M2 machine gun by the guide release pin through the holes in the rear mounting lugs of the receiver assembly. A scale shows 250 mils in depression and 100 mils in elevation. A setscrew fastens the elevating handwheel to the upper elevating screw, permitting the handwheel elevations to be synchronized with those on the screw. The traversing sleeve and screw are clamped in place on the bar by the traversing slide lock lever. The traversing sleeve is properly mounted when the lock lever is to the rear and the traversing handwheel is positioned to the left. (2) Front leg and bearing assembly head. The M3 tripod mount has three telescoping tubular legs connected at the bearing assembly head. The rear legs are joined together and supported by the bar. 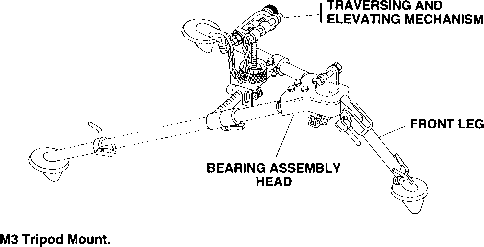 The bearing assembly head furnishes a front support for the mounted M2 machine gun which is supported by the front leg. Upper race rotates 360 degrees and contains a bearing assembly which receives pintles of the M142 or the 6650 mount. Has traverse lock which prevents the rotation of ring. How many mils are on the traversing bar of the m240g?